Zeitgeist is my ongoing series of paintings that explores the subject of humanity and its relationship with personal technology. I created this work to act as a social documentary that poses questions about the digital age in which we live, and the status of the human being living in that society. My inspiration for this work came from our ever-more consuming attachment to personal technology. We are all obsessed with it, and it’s quickly becoming a force that governs modern life. As a social realist painter, I’m particularly fascinated by how the physical and digital versions of ourselves are constantly changing. I read an interesting statistic recently (from Deloitte’s Mobile Consumer 2016) that 80 per cent of us admit to being active on our smartphones while in mid-conversation with friends. Seeing people glued to their devices is so commonplace now that we don’t give it a second glance. It is clear to see that personal devices are fundamentally altering the way we interact with each other, and this evolution is what I wanted to document through my work. 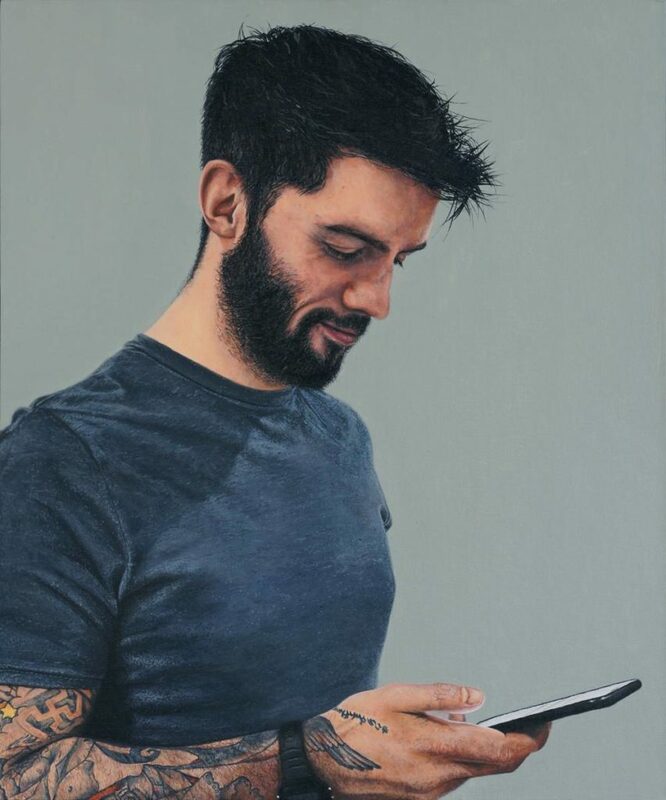 Being able to transform the often-overlooked elements of contemporary society is something I really enjoy about my work, whether that is capturing the solitary absorption of technology addicts in an isolated situation or highlighting the paradox of the antisocial nature of social media. With Zeitgeist, I like to deconstruct and reconstruct the people and compositions that I see around me, transforming them from their original context. I believe that this forces the viewer to focus on what that person is doing – and in doing so, it creates a psychological conflict in the painting’s composition between humanity and technology. It’s also fantastic that Warrington Museum & Art Gallery has been able to display all of the pieces that are in this series so far. It’s great because the paintings take on a completely different meaning when they’re shown together – it’s a case of the power of the collective. I think this exhibition is going to have a strong impact on visitors, and hopefully people will immediately see that my paintings are loaded with significance. For centuries, artists have been recording the zeitgeist – the spirit of the age – in their work, whether that was working-class life during the 1800s or everyday life in 1930s New York, like Edward Hopper did. I would love to know how my paintings will be interpreted by future generations, and how society has further developed by that time. Will we still be staring at our devices like zombies, or will technology be embedded into us by then?